There's an interesting photo essay on the rapidly disappearing town of Shishmaref on the ABC News Web site. The coastal Alaskan village has about 600 residents and is believed to have been inhabited (on and off) for 4,000 years. Today, with water rising about 10 feet a year,* it's in danger of sinking. The population of Shishmaref may soon count themselves among the first wave of global-warming refugees. As the effects of climate change worsen, there will be more Shishmarefs. Already there are places similarly adjusting—not just to a single awful hurricane or several bad droughts, but to a new pattern. Munshiganj, Bangladesh, is one such place. In the midst of a delta surrounded by rising seawater, the farmers in the Munshiganj district are seeing their livelihood die before them. Saltwater seeps into the groundwater, drinking water is growing scarce, rice paddies are dying out, and shrimp farming has become the new major industry. Der Spiegel has a striking slideshow. *As many have noted below, this was poor word choice on my part. Water rises up Shishmaref's coast at a rate of about 10 feet a year. This is due to a variety of factors including melting sea ice and permafrost—both of which have weakened the coastline. The sea level does not rise at that rate.—A.S. How or why is this linked with global warming? It seems to me that this has nothing to do with global warming but a piece of land that is sinking into the ocean due to subsidence. So the title of this SHOULD BE, a village adjusting to subsidence. Do you mean that the sea level at this village is rising 10 feet a year? Surely that cannot be the case. Is there instead a contained body of water that is rising 10 feet a year? If so, I'd be interested in the name of that body of water and the sources it has for such an alarming increase at that particular latitude. As for Bangladesh, if I recall the recent history of that particular part of that continent well, it seems that it is pretty much always at or about sea level. I believe it is primarily the Delta of the Ganges and two other rivers. Monsoons, tides, and other weather cycles seem to have had their way with Bangladesh for a long, long time. So you seem to have one place on the planet where the sea level has risen 10 feet and another place where if the sea has risen 3 feet most of the land goes underwater. Does water in the ocean still, generally, seek its own level, or has that property of water been rescinded? Perhaps this should be called "Popular Superstition" (Popsup for short). TEN FEET per year?? In your basement, maybe. Get your leaky roof fixed. Otherwise, you're making yourself look foolish by printing such ridiculous nonsense about the world's oceans. Abbey Seiff has no brain and no one should ever read anything she writes. Did the writer meant "The sea level is rising and have lost 10 ft a year of coast?". It was this kind of drivel that made me drop my Popular Science subscription. "Today, with water rising about 10 feet a year, it's in danger of sinking." Abby, please reread that sentence and realize how utterly illogical it is.
" The population of Shishmaref may soon count themselves among the first wave of global-warming refugees." I know it has been asked above, but I'll ask again; what in the name of God does subsidence have to do with global warming? Sad, another embarrassing assertion by pooped sigh. Is 'Science' just some vague term to these guys? How about 'Sellout'? This is part and parcel with the dominance of editors from the liberal arts. Just as a few months ago SI had a baseball cover depicting this kinda thing. Idiots playing at Science. I shiver for the future. Folks from New Orleans are also whining about subsidence. Blaming white folks, too: Corps of Engineers, Bush's racism, whatever. See http://www.nola.com/timespic/stories/index.ssf?/base/library-121/1172887209154410.xml&coll=1 for more details on the imminent washing away of New Orleans, levee or no levee, global warming or no global warming. Climates don’t care about political boundaries. Today, you read news about places far, far away from your home, downed. Don’t be surprise if tomorrow it comes for you. HA, ten feet of ocean rise, did liquid stop it's habit of self leveling or did the ocean just rise itself ten feet on this coast. Popular Science or Popular religion of global warming Well, which are you? No response from the author, I see. Your bluff has been called and you're shown to the world to be at best a careless reporter. Afraid to show your face here, Ms Seiff? Sorry for the delayed response. Not at all "afraid to show my face," Michael. Just rather busy. First, I want to apologize for what is clearly (albeit unintentionally) misleading language. Water rises up the coast of Shishmaref at the rate of 10 feet per year. As many of you pointed out, there is nowhere on earth where sea levels rise that much. I sincerely apologize for those unclear and incorrect words. 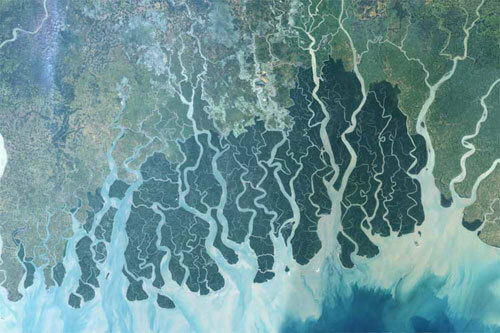 Nevertheless, neither Shishmaref nor Bangladesh is an example of subsidence or of water "seeking its level." Though neither is far from sea level, they are both above it, so the water-leveling argument seems unlikely. Shishmaref is experiencing a shrinking coast because rising temperatures have melted sea ice (which previously acted as a buttress protecting the coast from the tide) and reduced permafrost (which made the coast more susceptible to erosion). Insisting the change is simply due to subsidence and ignoring the role warming has played is foolish. As for Bangladesh, yes it has always had a history of "monsoons, tides and other weather cycles," but it has not had a history of increased salinity in groundwater and it has not had a history of marked, continuously rising sea levels. Interesting how the Stages of Grief theory is so well shown here. First is the Denial stage. Wait til you get to Depression. Much to conservative chagrin, Al Gore seems to have made global warming a big part of popular science. Seems only natural that the magazine that calls itself Popular Science would pick it up. NASA has for some time now. Probably about time to talk about it, as it's going to be a big problem. While it would be good to fully explain the circumstances in the article, the major point is that our climate is changing and our world is changing. It's starting to show itself in images, and it's starting to affect people in various regions. Time to leave denial behind and move forward. And get ready for the refugees - that's something conservatives care about, right? First of all, I do believe in the adverse effects in climate change, regardless of the cause (I does not mean I don’t care about the cause, but that we first have to establish the consequence, so we all become interested in looking for the cause, and not the other way around); so, in this case, the rising sea level, it seems that if water rises in one side, it should rise everywhere, right? I believe that the sea level information should be readily accessible for specialists, and would help your argument, if you include it in your article, or at least, a reference to it. That way, we would know that the sea level is indeed rising, obviously because of an increment in the volume of water, which in turn, has to come from somewhere; and if the polar ice is melting, we would have a reason for that increase, so the warming would explain the increasing sea level. For a host of reasons, air pressure, gravity anomolies, etc, sea level rises and falls at different rates in different places. Some islands see a 1 cm rise where others see -1cm, others see no change. For the ocean to "rise" by 10 feet in Alaska, would be impossible unless similar increases are seen along the coast in each direction. If the meaning was that 10 feet of shoreline disappear, then we are talking a whole different ballgame. If the sea rose by say 12 mm (1/2" or so) and the foreshore is only 10 mm above sea level for a distance of ten feet, then there will be a loss of 10 feet of shoreline. The case in Bangladesh could have many causes including delpetion of ground water for irrigation or through drought. It could also be conceivable that storm surge could salt the shoreline for a considerable distance. Ms. Seiff, is this the article where you got your information on Shishmaref? Very interesting indeed. I challenge all readers to do some more research. According to Newsweek´s April 28 1975 issue; we are heading into the next ice age! Even more astonishing are the proposed "cures" - such as dumping black soot on the north pole to induce melting of the polar cap! This was all written by "scientists" and "experts" back then who supported their arguments with excellent graphics and studies. The only thing that has been proven here is that the media hype will continue ad nauseam! And the truth....? "Now also, let me remind you, that even yesterday I saw on television, on global warming, I think on NBC evening news, all the worldwide television shows, when they start talking about global warming, they show the tongues of the glaciers, a big chunk of ice falling into the water. That has nothing to do—nothing to do—with global warming. People forget that a glacier is a piece of ice! It has to move! Okay, that's number one. Number two, they say, permafrost is melting, and houses are collapsing. What happens is that, when permafrost is in the area, housing is cheap and the land is cheap. When people build a house directly over the permafrost, and then warm the house in the Wintertime, and the ice underneath melts and the house collapses, that's a man-made effect! It has nothing to do with the greenhouse effect! There are so many mistakes like that. And of course, they show some of the Spring breakup, in Alaska, or some place. That's nothing new, that happens every year. It's terrible that [there's] so much misunderstanding. One thing is, for example, that ice will disappear by 2040 in the Summertime. Just one researcher got a result like that. But here at IARC, we work with 14 groups, together, and we see that, of the variety of results, some of them show that in the year 2050 there is lots of ice still. So, you know, 2040 is very misleading. Only one extreme case of science, and, unfortunately, the press take that kind of thing because they think it is much more interesting to report. So that's causing some more problems. But we have done good work with the 14 groups around the world, and some of this shows that even in 2100, lots of ice will remain." Yes, the webiste is a Lyndon Larouche site, but the words of Dr. Akasofu stand on their own merit. Just because there will be "lots of ice" in the year 2100 doesn't mean everything is A-OK, it just means the media and liberals have exaggerated. In reading all of your comments I just wonder why human beings are so afraid of recognizing they have an impact on the earth, and that that impact could actually be negative. The indigenous people who lived synergistically with nature for generations have been warning those of us who don't that the earth would react...just as we would react to abusive treatment, so will the earth. We are all connected and dependent on the earth for survival. How can you not see that all of the chemicals that we are pouring into the atmosphere and into our lakes and streams and oceans are having a detrimental impact on the planet? Are you totally asleep, head in the sand, involved in your own pursuit of "happiness" through the "things" you can have? Don't you realize that the world climate is changing and YOU are partially responsible? Even in our little neck of the woods, the old timers remember a much colder climate in these mountains. It was rare for this area to see 85 degrees in August. This year we hit the mid 80's in March...and our average temperature has climbed a few degrees every year for the past 10 years. Yes, WE are having to adjust, too. You may say it is the earth cycle...and it could be. But have you considered that it COULD be the way we abuse the planet???? What if we just make a few changes in our daily lives to support the planet that is supporting us? Pick your head up out of the sand and look around. Begin to notice how you are affecting the planet around you. How many hydrocarbons do you spew into the atmosphere? How many pesticides and herbicides do you spray? How many flourocarbons are you responsible for? How much of the Arsenic in the atmosphere can be directly attributed to YOUR lifestyle? That just touches a few points in a very long list. And whether you realize it or not, you are helping to poison yourselves along with the planet...greater incidence of cancer, fibromyalgia, migraine headaches, arthritis, autism, alzeimers...the list goes on...all of which can be helped or "cured" by clearing the body of its toxins. Check out the following websites...look at the pollution where you live. Look at the cases of disease and illness around you. Look at your own health. Look at the health of our planet Earth...and then, honestly, tell the world that WE are impacting the earth...and that Global Warming is not a bunch of hogwash. There have been major climate changes, both cooling and warming, long before humans had even campfires. I know that there is climate change taking place, but I seriously question if humans are the prime cause of it and if there is anything we can do to stop it. The fact that the political Left has embraced the idea that humans can control the world's climate by enacting laws makes me suspicious of their motives. Their tactics of deriding the opposing view, defunding them, making sure they do not get published and generally calling them names increases my suspicion of their motives. The article made no sense, it was incoherent and obviously written by one who follows the Leftist Global Warming theory by screaming "The sky is falling!" without seriously studying what ALL of the possible causes could be. People who leap to conclusions usually fall flat on their faces. PopSci does not need writers like this.